Is drone journalism coming to the UK? 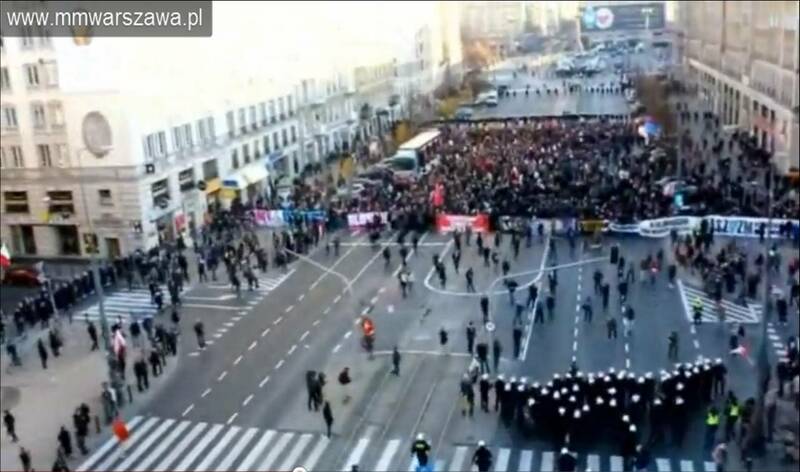 In November 2011, Polish firm RoboKopter filmed striking images of a political demonstration in Warsaw using a video camera attached to a drone or unmanned aerial vehicle (UAV). The New York Times heralded the footage as signalling the arrival of ‘drone journalism’. Since then, we haven’t seen many newsgathering drones in UK skies, but we might well be seeing them some time soon. Drones have been receiving more attention in recent months usually in the context of military operations. The Bureau of Investigative Journalism has been tracking the controversial use of drone strikes by the US military in Afghanistan, Pakistan and Africa. It has also emerged that the RAF were flying US drones during the conflict in Libya last year. But much smaller UAVs – whether fixed wing or rotary – are now being used in civilian settings not for targeted killing but for image gathering. Last week, BBC Newsnight explored some of the issues around civilian drones and earlier in the year, Al Jazeera English filmed a training exercise with the German fire brigade which showed how UAVs could support firefighting. I understand that several media organisations in the UK have already started to explore how they could use UAVs for newsgathering. Aerial footage is not new of course, but UAVs are much smaller than helicopters allowing them to provide imagery from previously inaccessible locations. The fact that they are unmanned also means there is no risk to a journalist or pilot. The latest models are being equipped with high definition technology allowing them to potentially provide stunning footage of national celebrations, political protest, natural disasters and conflict. The use of UAVs for newsgathering nevertheless raises a host of practical, legal and ethical issues. Question marks remain over safety concerns and the reliability of the technology, although the UAV industry is developing features such as an automatic ‘return to base’ function if the battery runs out or the operator loses control. Legally, there is already a fairly well-established regulatory framework in place in the UK for flying UAVs which is outlined in guidance issued by the Civil Aviation Authority (CAA). But this is an evolving area. The CAA’s chapter on ‘Civil Operations, Approval to Operate [UAVs]’ was completely rewritten in the latest guidance for August 2012. The requirements for ‘the licensing and training of United Kingdom civil Remote Pilots have not yet been fully developed’ and there is no European-wide standard to test UAV pilot competency. It is likely that larger media organisations will look to fully licensed and CAA approved UAV operators to provide them with a newsgathering capability or apply for their own licenses to operate UAVs. But there is no particular reason why smaller organisations or individual ‘citizen’ ‘drone’ ‘journalists’ couldn’t do the latter and attempt to gather their own footage. Gizmodo recently featured the (intriguingly named) Spy Hawk RC Glider which allows you to record video from the sky for a mere £250. With a battery life of 15 minutes it’s unlikely to have any heavyweight journalistic applications but we can expect the cost of more sophisticated equipment to come down. Ethically, UAVs are likely to compound longstanding editorial dilemmas. It is not hard to imagine scenarios in which the deployment of UAVs for newsgathering is likely to directly invade individuals’ privacy or indirectly facilitate ‘collateral intrusion’. These concerns might need to be balanced against a ‘public interest’ defence in a situation where it is deemed that the footage reveals serious wrongdoing. News organisations might then face requests from other organisations for access to video footage. Only last year, the Metropolitan Police asked UK media organisations to handover footage of the London riots, but the police have already been exploring the deployment of their own UAVs and are likely to continue to do so in the future. Indeed, in a rather strange – but perhaps not unrealistic vision of the future – it is possible to envisage a stand off between a fleet of media-operated UAVs and their police counterparts at the site of a protest or emergency. Newsgathering sorties might have to be coordinated or argued over with ‘rival’ UAV operators or interested parties. Another possible scenario which raises some profound questions is the use of UAVs in the context of conflict. What would happen if a news organisation flew a UAV from Jordan over the border into Syria? Will opposition activists of the future be streaming live video footage to YouTube shot with UAVs? Until now, these have been hypothetical debates set out in ‘future scenarios’ by interested thinkers and there has not been much visible evidence of UAVs being deployed by media organisations in the UK. But recently I’ve been in contact with several people from the media and UAV industries. Behind the scenes discussions are taking place about UAVs for newsgathering and I think we can expect to see major developments in this area within a year and perhaps even by the end of 2012. It would not be a surprise to see UAV footage being played out on air in the near future and maybe we’ll run into some of these other issues before too long as well. So watch this space – the one just above your head.